In addition, you are able to find individual records of all players that have played for Leeds United's first team, including those who have been an unused substitute without actually playing. As I develop this database, you will be able to view the details of all games played during War time, friendlies and games at reserve and youth level. I am still researching and have keyed the detail found in this database (on and off) over the past four years. I continue to trawl my way through newspapers, reference books and my extensive collection of Leeds United home and away match day programmes. In addition, I have received snippets of information from various football clubs historians and gleaned bits of information via Twitter. I suppose that these things are never complete as I will always come across new bits of detail which I wasn't previously aware of. The Football League did not record attendance figures until 1925, therefore, I have omitted the attendances from the early years. The figures are detailed in various record books and other websites but are estimated, not official and do vary. The three games played at the start of the aborted 1939-40 season are not included within the players records. Some publications do include these games but they are not officially recognised by the Football Association/Football League. Records for the FA Cup games played during the 1945-46 campaign are recognised and do appear. A full 'war-time' football section will be produced in time. This database is not complete at the moment and is very much work in progress. I try and complete more information daily, so please keep returning. If you wish to provide feedback (good or bad), notice any errors or you can add any detail, please contact me or tweet me @brac4773. This section of my website is dedicated to the memory of my friend and Leeds United supporter, Dale Hepworth. R.I.P Dale. Marching on Together! 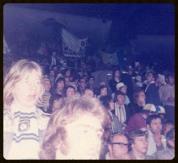 The picture of Dale (far left, wearing the scarf) was taken by Heidi Haigh at the Leeds United vs Bayern Munich European Cup Final in 1975 and features in her book, "Follow me and Leeds United", which is available to buy on Amazon.